What's new in Music Duplicate Remover 9.0? [+] It is now possible to define whether the program should prefer bitrate or file format when choosing files to keep. In previous versions of Music Duplicate Remover you could specify which formats you preferred and whether you needed files with higher or lower bitrate. For example, you could move FLAC to the top of the list, and Music Duplicate Remover always preferred FLAC files, marking copies in other formats as duplicates. You can find this field on the "Grouping options" tab. [+] Added support for M4a files. 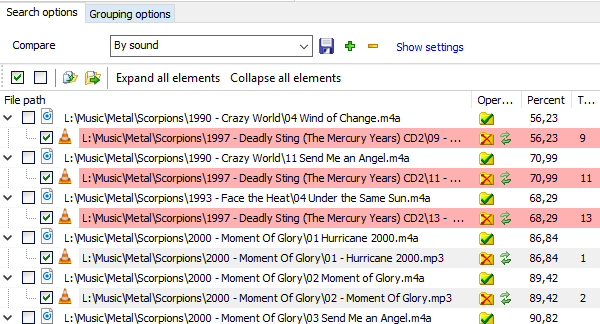 The new version of Music Duplicate Remover additionally supports audio files in the M4a format. Such files can be compared with each other and with files in other supported formats. 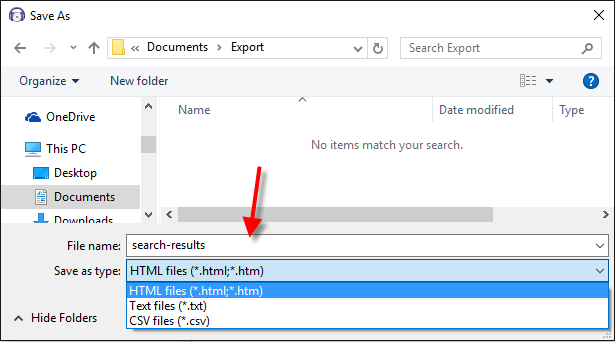 [+] Added an option to export duplicate search results to TXT, HTML, or CSV files. The audio engine allows playing audio files directly in the program, so that you can easily check which files are to be kept. The audio engine was updated in Music Duplicate Remover 9.0 to support a wider range of format variations. [*] When copying duplicates to a selected folder, the program now renames files with identical filenames instead of overwriting them. Previous versions of Music Duplicate Remover might overwrite duplicates with the same filenames, if the user chose to copy such duplicates into some folder. In Music Duplicate Remover 9.0, there is a new option, which allows to rename duplicates with identical names instead of overwriting them. The option is on by default. 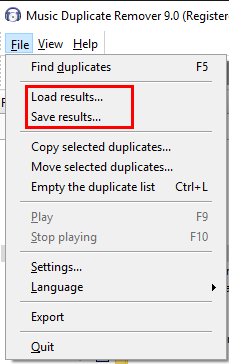 You can access the option in the "Copy files" dialog shown when you click the corresponding button in the list of duplicates. [*] The list of duplicates does not collapse after swapping. Previous versions would collapse the list of duplicates after this operation. Music Duplicate Remover 9.0 preserves the previous state of the list. [-] Fixed saving results of a search for duplicates into a file. A problem was discovered in the previous version. In some situations Music Duplicate Remover could save its results incorrectly, which made them unusable and required re-scanning. This was fixed in Music Duplicate Remover 9.0. [-] Fixed the Invalid pointer operation error that was shown when the user chose to delete original files instead of duplicates. If you want to keep a different audio files than suggested by the program, you can click the "Swap" icon next to the corresponding duplicate. This will set the duplicate as the main file, and the former main file will become a duplicate marked for removal. However, some users find it easier to uncheck duplicates and check original files for removal. In such situation, previous versions of Music Duplicate Remover might throw an error message. Music Duplicate Remover 9.0 can process such situations correctly. As usual, there are other small improvements and big fixes in Music Duplicate Remover 9.0. Please contact us if you discover a bug or would like to suggest a feature.